Abstract: This thesis investigates polarization-insensitive methods for optical signal processing. 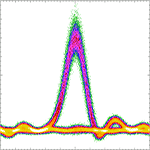 Two signal processing techniques are studied: clock recovery based on two-photon absorption in silicon and demultiplexing based on cross-phase modulation in highly nonlinear fiber. The clock recovery system is tested at an 80 Gb/s data rate for both back-to-back and transmission experiments. The demultiplexer is tested at a 160 Gb/s data rate in a backto- back experiment. We experimentally demonstrate methods for eliminating polarization dependence in both systems. Our experimental results are confirmed by theoretical and numerical analysis.